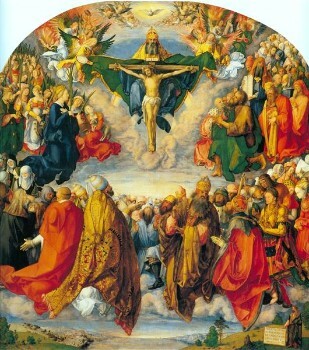 Happy All Saints' to you! Celebrated on November 1st, this festival is commonly celebrated in church life the following Sunday, and that is exactly what we'll do! We'll be celebrating the “communion of the saints” and that we are, in Jesus, part of a fellowship that bridges life and death, across ethnicities, and over time. I am excited to celebrate our union in Christ together on Sunday! We will celebrate a couple of different ways. In The Garden our children will learn about and celebrate this reality, and will even be “visited” by a few saints of old. “All Saints’” will be our focus in worship as well, and we’ll have a couple of elements to mark it. One element of our worship will be an adapted Prayers of the People that will involve naming those who have “died in the faith” for whom we are thankful. In preparation for this time you might reflect on someone whose life and faith has been a particular blessing to you. There will be an opportunity to light a candle in remembrance. We’ll also take a moment on Sunday to welcome and pray those people who have become members this past year at COTC. If you missed last Sunday I also wanted to let you know that we announced that our offer to purchase a church property in the Windsor Park area was voted on and accepted by the other congregation. Even as we anticipate continuing to worship at the Phillips Event Center for the foreseeable future, and there are miles to go as we anticipate entering a feasibility/option period toward the end of this month - this is big news! Please join me in praying for wisdom and the Lord’s leading and provision in this. Please also plan to attend a congregational meeting following worship, on Sunday, November 11th (note: we are moving the scheduled Lunch and Learn one week to the 18th), childcare will be provided and we'll be updating you on the property and parameters of the deal, and how we see this property fits with our vision and values. I encourage you to attend!